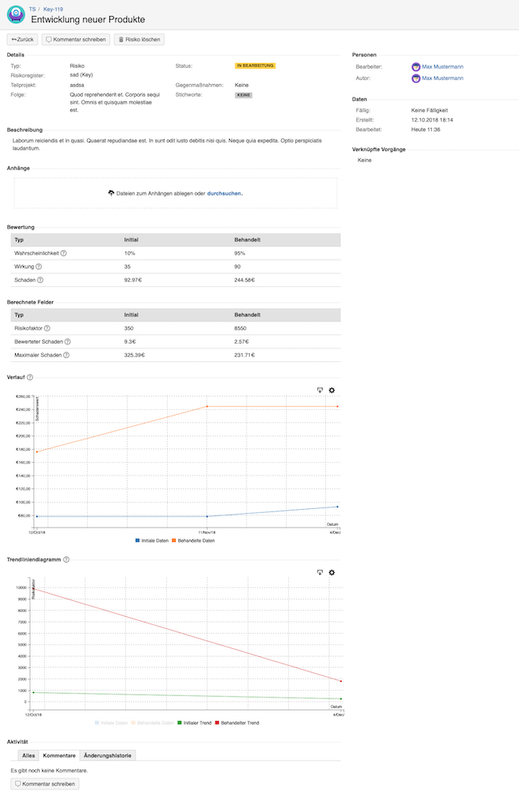 Agile risk management integrated into Jira enables transparent, independent and user-friendly presentation of all relevant risk management data. Integration in Jira and linking to your existing projects..
Management of monetary risks / opportunities on the basis of probability and effect, damage, risk factor, maximum damage separately for the initial and treated values. Qualitative assessment of risks / opportunities based on probability and effect. In each case, the initial and treated values are valued separately. Manage any number of risk registers in your Jira projects to structure your individual risk management. Evaluation of risks / opportunities in an individually adaptable risk matrix. - Monetary evaluation of risks / opportunities and their history to illustrate the course of events. - Trend line diagram for probability of occurrence / risk factor including history to show the development. View, edit and evaluate your project risks and opportunities directly in Jira. Link risks and opportunities to your Jira issues or link Jira issues as countermeasures. 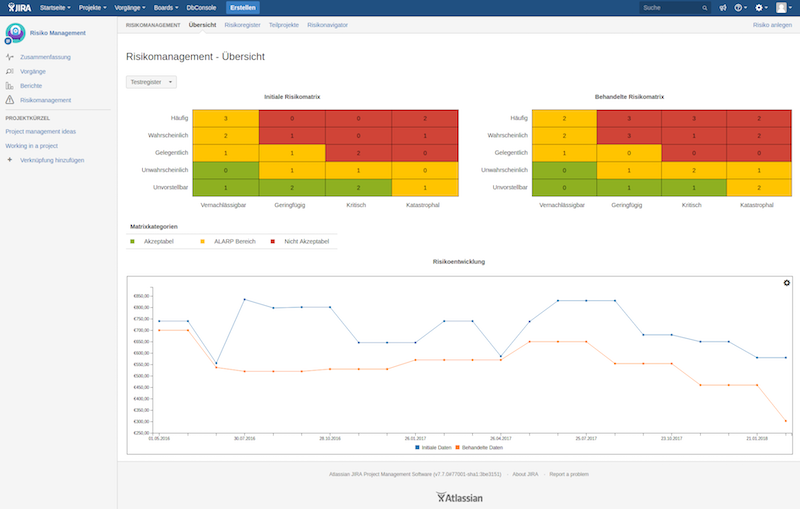 Agile Risk Management integrates directly into Atlassian Jira. Project centric integration enables risk management to be initiated directly via your projects. Automatic evaluation and sorting into your project specific risk matrix. Create your process- / company-specific risk matrix. Or use the standard risk matrix to start risk management immediately. Create individual threshold values for the classification of probability of occurrence and effect. Keep track of risk and opportunity categorization with the interactive risk matrix. Get the filtered result directly. Automatic, progression-based evaluation of initial and treated monetary values for risks and opportunities. Get the latest monetary evaluation of your project risks and opportunities in the risk dashboard. The monetary evaluation is done by a line graphic. The X axis represents the time and the Y axis the amount of money. 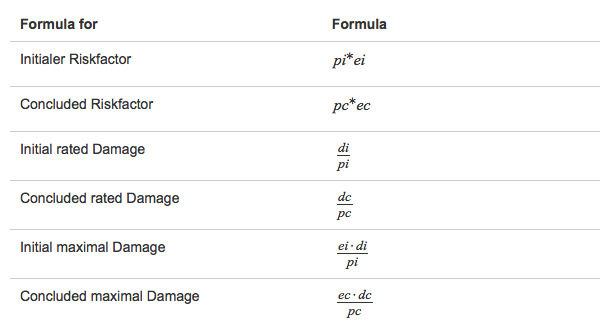 The system displays one value line with the development of the sum of the initial damage and one value line for the sum of the assessed damage. The scaling of the axes is done automatically. The data are obtained from the history of the individual risks of the current project. The risk dashboard gives you a constant overview of the current trend development of the probability of occurrence or risk factor for all your risks. The trend line graph shows the accumulated values for risk factor or probability over time. It shows the accumulated values for risk factor or probability initially, after taking countermeasures (treated) and the current trend development. The trend line chart is also available separately for each risk. Use your process/enterprise formulas to calculate the initial/valued risk factor and other fields such as valuated loss and maximum loss. Or use the standard formula configuration to start with risk management immediately. Start today with the free, non-binding trial version of Agile Risk Manament and experience agile risk management at a new level. Try Agile Risk Management for Jira today without obligation and free of charge! Find out more in the documentation of Agile Risk Management. Monetary - Allows a monetary evaluation of risks in addition to the probability and effect categorization. What are scalar risk registers? What are monetary risk registers? New feature: Trend line diagram for risk factor and probability in risk dashboard and risk detail view. The contents of our pages have been prepared with the utmost care. However, we cannot assume any liability for the accuracy, completeness and up-to-dateness of the contents. Pursuant to section 7, para. 1 of the TMG (Telemediengesetz – Tele Media Act by German law), we as service providers are liable for our own content on these pages in accordance with general laws. However, pursuant to sections 8 to 10 of the TMG, we as service providers are not under obligation to monitor external information provided or stored on our website. Once we have become aware of a specific infringement of the law, we will immediately remove the content in question. Any liability concerning this matter can only be assumed from the point in time at which the infringement becomes known to us. A visit to our website results in the storage on our server of information about the access (date, time, accessed pages). This does not represent any analysis of personal data (e.g., name, address or e-mail address). Our website can be used without entering personal data. The use of individual services on our website may be subject to different requirements that are separately detailed below as applicable. We will only process your personal data (e.g. name, address, e-mail address, telephone number, etc.) in keeping with the requirements of German data protection law. Data are personal if they are uniquely attributable to a specific natural person. Please see the German Federal Data Protection Act (BDSG) and Telemedia Act (TMG) for information about the legal data protection basis. The provisions below are insofar designed to inform you on the type, scope and purpose of the provider’s collection, use and processing of personal data. We would like to point out that online data transmission is subject to security flaws rendering seamless protection from third-party access impossible. We use so-called cookies on our website to detect the recurrent use of our offer by the same user/internet connection owner. Cookies are small text files that are filed and stored in your computer by your internet browser. They serve to optimize our online presentation and offers. Most of them are so-called ‘session cookies’ that will be deleted again after your visit. Some of these cookies will also send information enabling your later automatic recognition, however. This later recognition is based on the IP address stored in the cookies. The information obtained this way serves to optimize our offers and facilitate your access to our website. You can prevent the installation of cookies by providing your browser with the corresponding settings, but we need to point out that you may not be able to make full use of all our website’s functions in this case. These anonymous data are stored separately from any other personal data you may disclose and will thus not be traceable to a specific person. They are evaluated for statistical purposes to enable our website and offers to be optimized. Our website offers you the option of contacting us by e-mail and/or a contact form. In this case the data provided by the user will be stored for processing this contact. They will not be forwarded to third parties. There is also no comparison of the data collected this way with data possibly collected by other components of our website. The Federal Data Protection Act enables you to contact us free of charge with any questions you may have about the collection, processing or use of your personal data, their correction, blocking or deletion, or the cancellation of approvals already provided by you. We would like to point out that you are entitled to have wrong data corrected or personal data deleted insofar as this is not in breach of statutory retention periods.